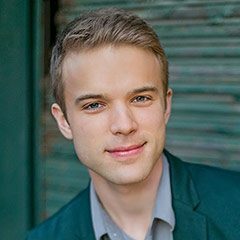 Cellist Rainer Crosett (GCRT ’17), currently a graduate student of USC Thornton Strings chair Ralph Kirshbaum, has won the 2018 Pierre Fournier Award, one of the top honors in the field. Crosett, the first American cellist to win the Fournier Award, will present a debut recital at London’s Wigmore Hall, a concerto performance with the London Philharmonia Orchestra, and an album recording. A 2016 performance of Chopin’s Introduction and Polonaise by Rainer Crosett and pianist Somang Jeagal. Crosset is a former winner of the Houston Symphony Orchestra’s Ima Hogg Concerto Competition and the New England Conservatory Concerto Competition, and has appeared at Carnegie Hall, Boston’s Symphony Hall, and the Amsterdam Concertgebow.